“It’s my favorite food,” she began. I tell you this story for one simple reason. Well, two. The first is that my wife’s a nut and I want it on record. But the second is that nobody’s favorite food is Cheerios. And nobody’s favorite superhero is Wonder Woman. Nothing against America’s favorite non-retail Amazon, but the sad reality within DC is that for all her iconic status, Wonder Woman’s been about as consistently well-liked as a poppy seed. Despite numerous attempts to inject life into the franchise, the old DCU Wonder Woman was never able to draw much of an audience. This may say more about American society than the creators taking a stab at her, but it always seemed like Princess Diana generated the most attention when she was cloud-copulating with the Man of Steel. Not exactly the beacon of feminism I think most would prefer. So the fact that writer Brian Azzarello and artist Cliff Chiang have somehow turned the Amazon royalty into one of the essential New 52 comics might be the most impressive turnaround of the relaunch. How did they do it? How have they made Wonder Woman cool again for the first time? By taking the focus off Diana. It’s pretty telling that in Wonder Woman #1 we don’t even see Diana until page number eleven. Instead, the opening-stretch is devoted to a couple of Greek Gods, Apollo and Hermes, although we won’t fully realize that until later (side note: Issue #1 is immensely confusing as a first issue introduction to the new 52 Wonder Woman. It makes sense in retrospect, but if you’re just hopping on board, know that it all comes together quickly after). This has been Brian Azzarello’s masterstroke: Bringing Greek mythology to life and establishing the likes of Zeus, Hera, and Ares as the central foils in Wonder Woman’s inevitable struggle. The effects are incredible and take an enormous amount of pressure off Wonder Woman. As a protagonist, she frequently plays 2nd and sometimes 3rd fiddle in her own book – and it works. Instead of tired and played out relational struggles with Colonel Steve Trevor (saved for the pages of Justice League), or harping on the ostracized role Diana might play to her Amazonian sisters on Paradise Island, Wonder Woman ascends to a deserving level of conflict and intrigue. She isn’t just tossing around a bundle or rope to protect her dear Themyscira; she’s warring with the very gods for the throne of Zeus. And there we have Azzarello’s central plot thread: Zeus has gone missing, and the stage is set for manipulative, vindictive petty, power-hungry gods to make a play for their strongest interests. In a relatively major twist, Wonder Woman’s origin is revised to tie her more deeply to this dysfunctional family of gods. 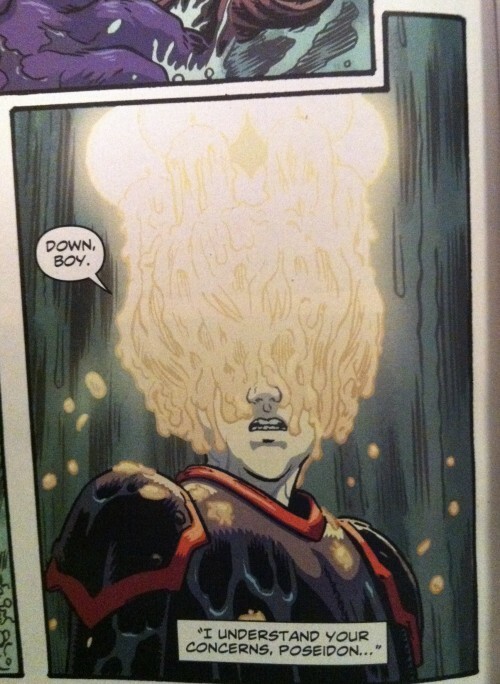 I won’t spoil the totality of it, but it’s honestly one of the best reinventions so far in the New 52, and helps make a strong case for the success and necessity of the whole new 52 initiative. Much to their credit. 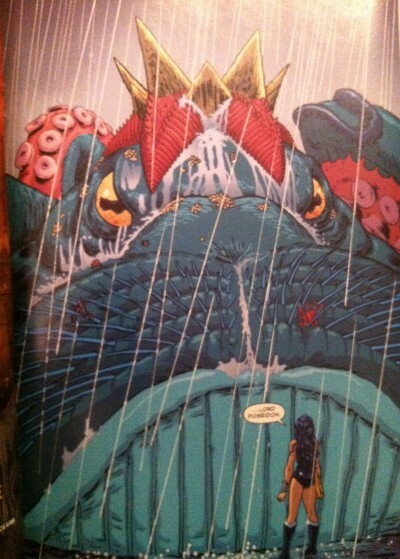 Azzarello and Chiang have found that there’s some substance to Wonder Woman’s exclamatory “Great Hera!” There’s a reason the outdated pantheon of Zeus, Ares, Poseidon and Hades are still prominent residents of the public consciousness. Even among the seemingly everlasting sagas of comic book heroes – and even compared to the long history of Wonder Woman herself – there are certain mythologies that carry an ancient sense of mystery and wonder. The Greek gods? They’ve got this on lock down. There are a handful of fun individual moments throughout this arc (Hades shooting through Wonder Woman’s magic bracelets with Eros’ golden pistol comes to mind), but the images that stand out the most are the various introductions of the Greek gods. In Wonder Woman, primary artist Cliff Chiang has a chance to reimagine some of the longest lasting and most well recognized names in history. Fortunately for us, Chiang is up to the challenge, and dramatically avoids the temptation to faithfully recreate the anthropomorphic expectations we’ve seen from Michelangelo through Disney’s Hercules. Instead, Chiang taps into the essence of the god and pulls out something new. 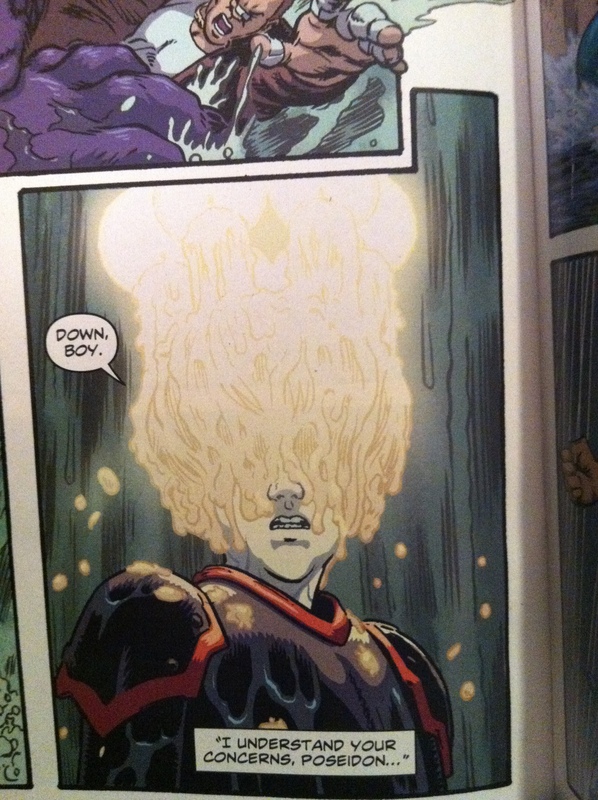 Much like Mateus Santolouco in Dial H the reveal of each new god is a consistent highlight. What Can Wonder Woman #0 Tell Us About Her Future? 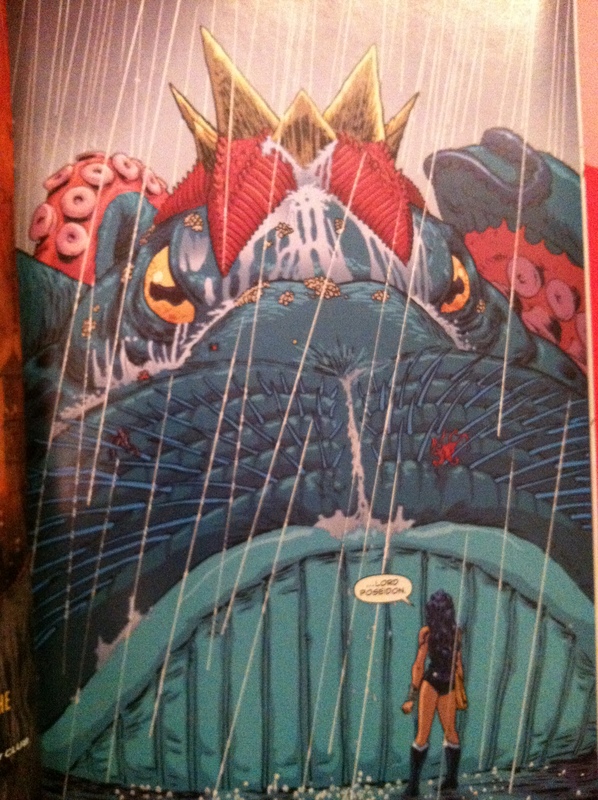 Issue #0 doesn’t reveal much about the future, but it does do a fun job of truly recreating Wonder Woman’s past. In an homage to Silver Age Wonder Woman, the comic mimics the art style, lettering, voice, and best of all Brian “Kiss My” Azzarello and Cliff “Chump” Chiang style credits. Mostly, though, issue zero repitches Wonder Woman’s long lasting connection to the Greek pantheon, and helps explains Ares motivations thus far in the twelve issue saga. 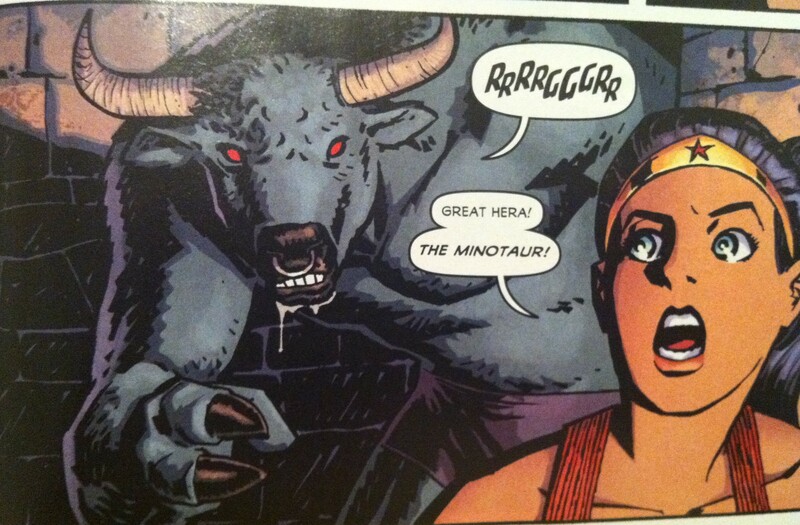 Fans of Daedalus’s labyrinth and the Minotaur will want to take note, as both are prominently featured here. End of the day, Brian Azzarello and Cliff Chiang are making the Greek gods the stars of Wonder Woman, and it’s making the world’s foremost female superhero more relevant than ever.